Originator of the multi-window idea. Not only full screen browser. 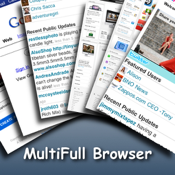 Browse up to 4 web sites simultaneously. Don't go back and forth to compare web sites. Read a web page with free dictionary on side window. Close the window when you find the word. Monitor 4 web sites at once using home/reload button. Maximize any window to use full screen. Browse comfortably in any posture with Orientation Lock. Tap the blue button at lower right corner to show tool bar. ✔ Orientation Lock. Browse in any posture. ▶ Please visit feedback forum when you have any suggestions/options/problems. Click 'MultiFull Browser Support' link below. ▶ 학습용으로도 좋습니다. 세로 보기 모드에서 위에는 영자 신문 웹사이트를 올려놓고, 아래에는 사전 사이트를 올려놓으면, 바로 단어 검색을 하면서 읽을 수 있습니다. 단어를 본 후에는 을 눌러서 단어 화면을 닫습니다. ▶ To colonialmike: Bookmark is supported. Press the action button and scroll down.